More space for working, less stress while serving. 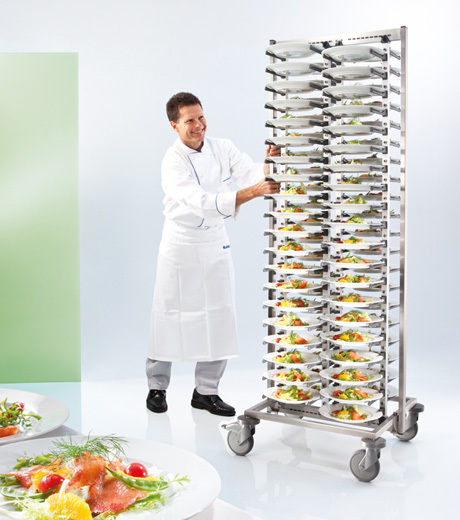 The innovative BLANCO SERVISTAR plate stacking system provides space for gastronomic creativity, effective working and a relaxed path from the chef to the guest. No clattering, no clinking, no trouble: The plates rest on the plate holders in a soft and non-slip position due to the fine elastic soft-grip surface. As gentle and secure as the human hand: The clever plate holders make arranging, transporting and serving food a safe and quick matter. With its 80 cm plate spacing, SERVISTAR leaves you enough room for all your ideas while arranging food in an appetising way. The bend and twist-resistant stainless steel frames which are each permanently welded give the SERVISTAR its rugged strength. The clever plate holders with a soft-grip surface ensure maximum safety during transport. The plate holder rows can be steplessly adjusted to all plate sizes up to 30 cm, regardless of whether they are round or rectangular.